I’m back! Like a bear emerging out of hibernation, I’m functioning once again—thanks to coffee. I told you that I hated the holidays—I had to sleep in a coffin after Halloween just to escape the torture! 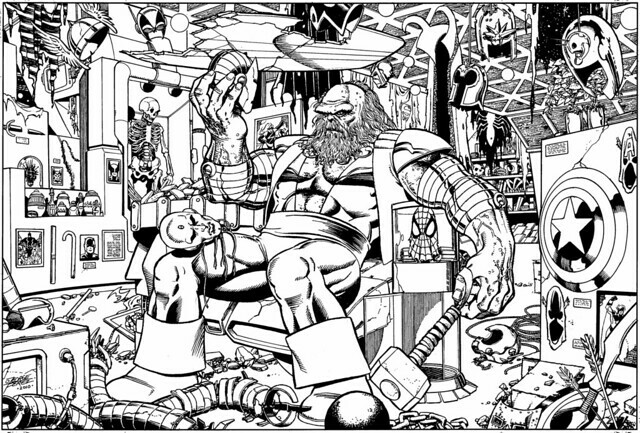 Time to look at the electronic long box of commissions and scans, just like this fellow megalomaniac…The Maestro! On the wall underneath: Pictures of Warlock (New Mutants), Beast, Inhumans, Daredevil. Captain America’s mask & shield. The Thing’s picture of the left side of the Maestro’s leg. The Vision’s head on the Maestro’s leg. Iron Man’s helmet in his right hand. Cyclops visor on top of the TV. There is a lot more I didn’t name. Do you see those bottles on the left, right under the Beast’s picture? Do those have some meaning or are they just decoration? An outstanding commission by Perez. Whoever owns this should be bursting with Marvel pride! Nuff Said. In the comic you see at one point that the jars are urns of ashes of people such as the Wasp, the Leader, Jean Grey and Betty Banner. and you can see the page. also... at one point me and some friends tried to label everything in the spread on my flickr account. Superman's Cape above his left shoulder? Thanks for the quick feedback on the jars. Of course, urns for all the ashes of misc heroes! Nice link, too. I had forgotten that this room belonged to Rick Jones. Have to go back and re-read those books. Dane Whitman's Black Knight helmet overhead. By Maestro's right elbow, a container carrying the rocky plating that formed The Thing's exoskeleton. The Sword of Conan and his loincloth above, mid image left (If we have DC items we do know Conan had visited our time period once). A suspicious looking "railway" lantern that I suspect might be colored green. Next to the jar with Warlock's head in it is a photo of Hank McCoy....next to his PELT! To the image Left of superman's cape is, I believe, Thanos' helmet. Behind Ant-man's helmet is the helmet of The Frightful Four's "Wizard". The plants (Kotati?) top right are being grown in Mar-vel's wristbands. On the floor behind the photo of the The Thing are the Scarlet Witch's's headpiece and, I suspect, her cape. The ball and chain seem a bit small for Thunderball....perhaps they belonged to one-time Hulk foe, The Absorbing Man? There is a ring in front of Cyclops' visor...one of The Mandarin's perhaps? And lower image right...Doctor Doom's mask. One more....the helmet I assumed to be Thanos is, on further inspection, one of the Crimson Dynamo's. Also, the skull next to the bottled city of Kandor? The Red Skull's red skull mask. One more....the Yellowjacket Helmet? Rita DeMara's, not one of Pym's. Good going Reverend! You know your Marvel history!!! !